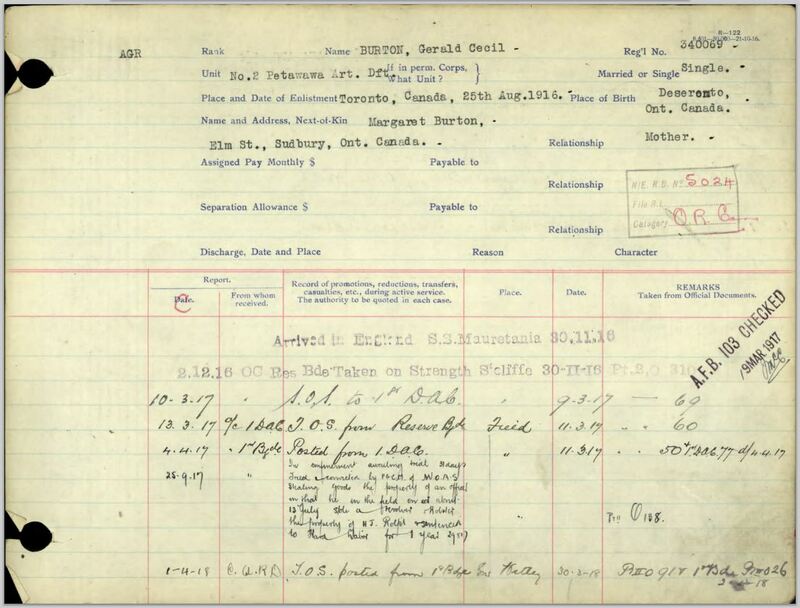 One of the most useful records for finding out about a Canadian person’s experience of World War I is their service file. These records are looked after by Library and Archives Canada, who have been busy converting 640,000 of these paper files into digital form over the past few years. 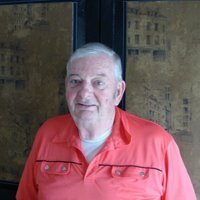 In this post, we take a look at what types of information these files contain, using the file of Gerald Cecil Burton as an example. Attestation papers are the form that people signed when they enlisted. (Click on the image for a closer look.) On the front page, information about the individual’s date and place of birth, address, next of kin, occupation, and military experience were recorded. This page was also signed in two places by the enlistee. In the Deseronto First World War project we have been using these signatures to illustrate the blog posts about each Deseronto veteran, as very often we don’t have photographs of the people, but there is nearly always a signature. Towards the top right of the form, the soldier’s regimental number was noted. This is a unique identifier which is helpful in distinguishing between two men of the same name. In our group of records, for example, there were two Jacob Greens (644773 and 636686) and two Wilbert Brants (785039 and 636958). The military unit that the individual initially joined is usually noted at the top of the form, although often this is not the unit that the person ended up serving with in Europe. On the back of the form, details of the recruit’s physical appearance were recorded, including apparent age, height, colouring, chest measurement and any distinguishing marks, such as tattoos or scars. 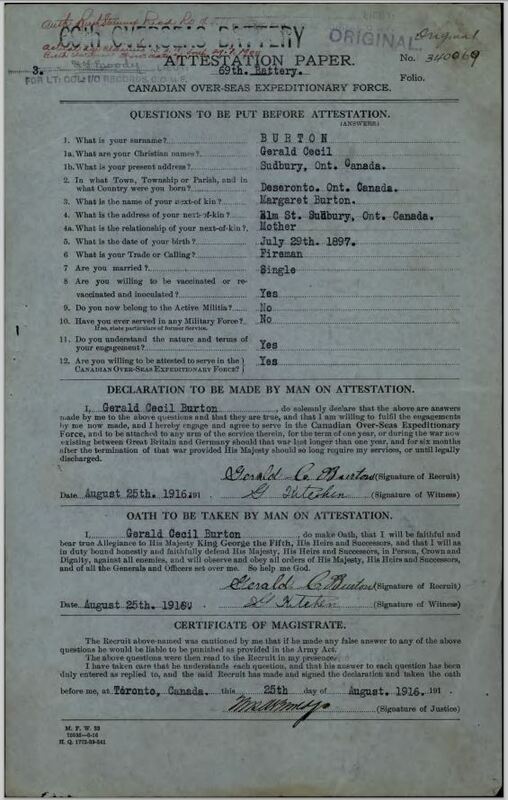 Attestation papers were the first World War I records to be digitized by Library and Archives Canada. They were not taken from the service files, but from a separate series of Attestation Registers (RG 9, II B8). Some people (about 50,000) are missing from that series, and for those individuals the newly-digitized service files provide the first glimpse of their attestation paper information. Record of Service forms like the one below are very useful for determining the course of an individual’s wartime career. These forms are copies of army orders relating to the person. They record transfers between military units, arrivals and departures, injuries, and penalties. For example, the card above shows that Gerald Cecil Burton arrived in England on the SS Mauritania on November 30th, 1916. It also notes that he was sentenced to a year of hard labour for stealing a revolver and holster. Service files often contain detailed medical records: some even have x-ray photographs of injured limbs. 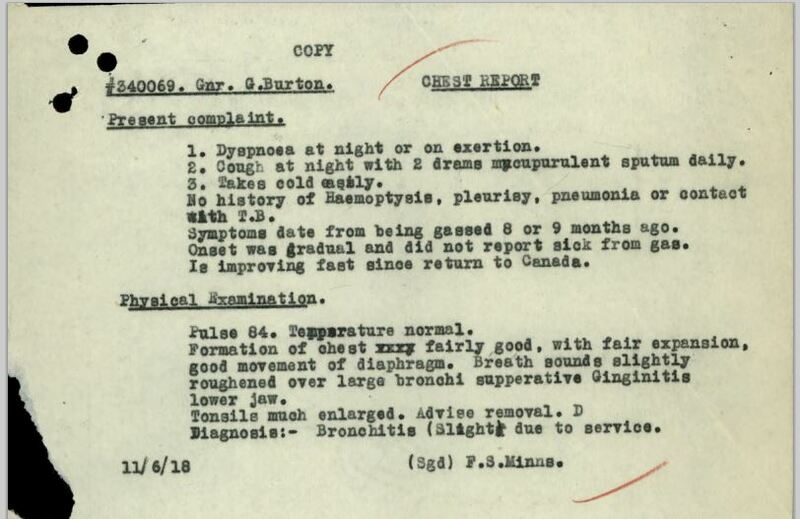 In this example from Gerald Burton’s file, details of a diagnosis of bronchitis are noted. 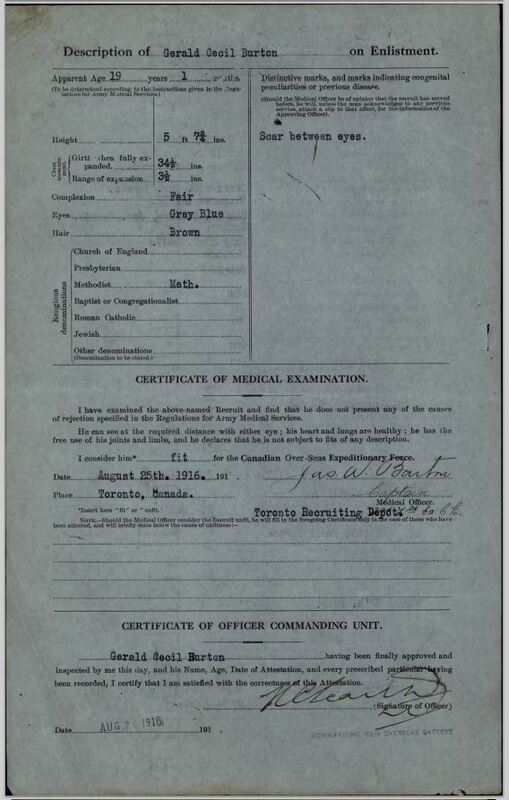 The files also usually have information on the dental health of recruits, with details of fillings and extractions. The service files are a wonderful resource for First World War research, and digitizing them has been an enormous project for Library and Archives Canada. Thank you very much to everyone involved in the effort! A significant change to the operation of the Deseronto Archives will be happening in September 2016, as we are moving the collection into the new Community Archives of Belleville and Hastings County in Belleville. 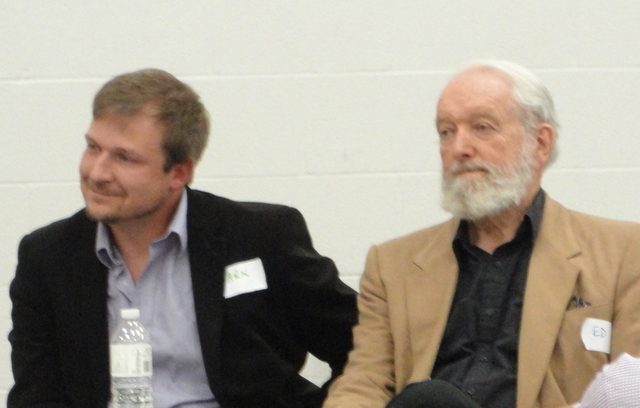 From September 12th, the Archives will be available for research in Belleville. This increases the availability of the collection, which will now be open to the public from Monday to Thursday, 9.30 to 12 and 1 to 4pm instead of the limited hours we have been open in Deseronto. The Town of Deseronto was the first municipality in Hastings County to provide a staffed archive service, back in 1997. 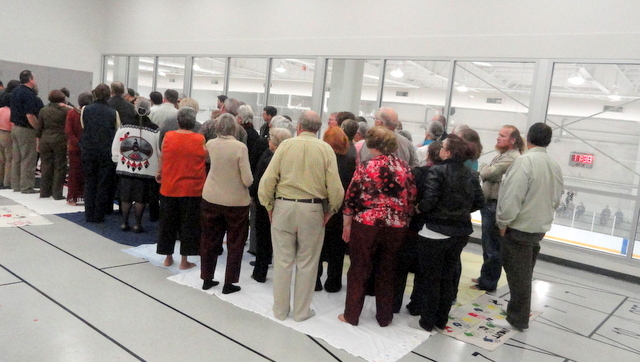 Now it is joining the City of Belleville and the County of Hastings in taking advantage of the facilities of the new Community Archives of Belleville and Hastings County. 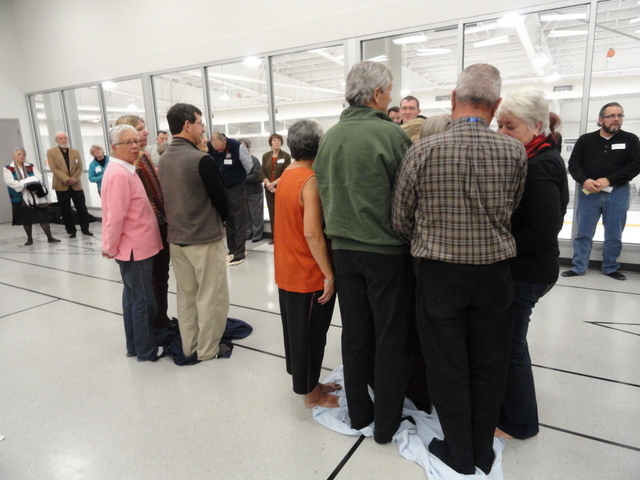 There our local records will be kept in climate-controlled conditions in a brand-new facility. Amanda Hill, the Deseronto archivist, has also relocated to the new archives at Belleville, which will provide a continuity of care for the Deseronto materials and knowledge of their contents. This website will continue to be updated with news from the Deseronto First World War project, and Deseronto Archives images will remain available from our Flickr account. The email address to contact the Archives is now archives@cabhc.ca and you can also call 613-967-3304. Grateful thanks are owed to Frances Smith and all the staff at Deseronto Public Library for providing a home for the Deseronto Archives, and also to the Deseronto Archives Board and the Corporation of the Town of Deseronto for their support of the Archives over the past 20 years and their continued dedication to the service as it enters this new phase. Our First World War project is now in full swing, with research under way on 300 people with Deseronto connections who served in the war. There are excellent online resources available for such research and this post explains more about the ones we have been using for our project. Service files of individuals are rich sources of information about the war service of Canadian men and women. Library and Archives Canada (LAC) are in the process of digitizing all of the World War I service files they hold and many are already available. There’s a helpful LAC Cenotaph research guide to interpreting these records, which explains the military organizations, the abbreviations used in the records and has a timeline of the major battles Canadian troops were involved in. Attestation papers are available online for nearly all veterans of the war. These documents give the name of the enlisting person, their next of kin, their place of birth, occupation and home address. They also hold information about the individual’s height, chest size, and hair, skin and eye colour. Attestation papers also carry the signature (in some cases just the mark) of the enlistee, which we have been using in our project to illustrate each blog post. War diaries for the various military units are also available at Library and Archives Canada – these have all been digitized and can be read online. These are invaluable for finding out more about where a particular battalion was and what it was doing at a particular time. Births, marriages and deaths in Ontario from the Archives of Ontario. These are useful for establishing who a veteran’s parents were and whether the veteran was married. 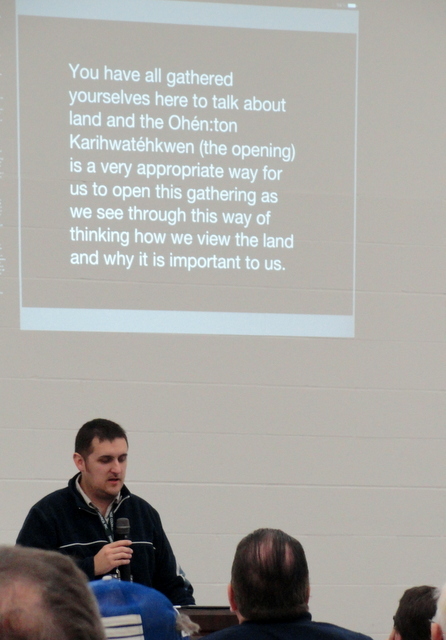 Provided to Ancestry by Library and Archives Canada. Useful for discovering dates of birth (particularly the 1901 census), family members, locations, ethnicity, and occupations of veterans. Ancestry also holds copies of the attestation papers from Library and Archives Canada. This site brings together information about many of the men who died in the First World War. It includes links to the Canadian Virtual War Memorial and the Commonwealth War Graves Commission entries for individual soldiers. A site maintained by Veterans Affairs Canada which commemorates fallen Canadian soldiers from all conflicts. Users can upload digital materials about a soldier. Digitized local American newspapers from 1866 to 1922, free to access in a service provided by the Library of Congress. This site is useful for finding reports on some of the airmen who died in the Royal Flying Corps camps. This site holds information on cemetery locations, graves and memorials. For individual solders, there are digitized registers with brief details about each man and information about what was recorded on their headstones. This site has many veterans’ graves listed, particularly those in the European war cemeteries. Several have photographs of the headstones. This UK-focused site requires a subscription. It holds records relating to men who served in the Royal Flying Corps and Royal Air Force in the First World War. The Storyvault contains freely-accessible* digitized records of death and injury reports relating to the Royal Flying Corps and the Royal Air Force between 1914 and 1928. For the period of operation of the two Royal Flying Corps pilot training camps near Deseronto, these records are extremely helpful in explaining the causes of the accidents which befell the young men who died in training during the First World War. There are articles in Wikipedia on most of the military units which took part in World War One. The site also holds information on military campaigns, ships used to transport soldiers between Canada and England, and information on the diseases suffered by soldiers on the Western Front.